Welcome to Living Soil. We provide all natural composting products for home and garden. Please browse our safe and proven ecological composing products, to improve your garden and health, and for larger scale products for agriculture, waste and septic treatment, and environmental sustainability. We are dedicated to supporting the abundance of your home garden, or farm. 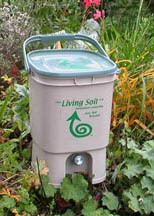 Living Soil pioneered the use of Bokashi in the UK since 2000. Bokashi and Kitchen waste digesters are a safe and convenient way to deal with food waste, and the compost boosts the vibrancy and productivity of your garden or farm. Make your garden glow! Using two in combination provides far better waste digestion and 100% recycling of all your food waste. Our Kitchen Waste Digesters are made from superior quality ceramic-plastic with a with handy tap for draining off probiotic-rich plant food. They have been used around the world for more than 15 years. Feedback tells us that imitation plastic containers simply aren't up to the job and break quickly. The future of home composting and the solution to the landfill problem. Time tested and proven in Japan and America. Recycle 100% of your kitchen waste and regenerate the health of your environment. 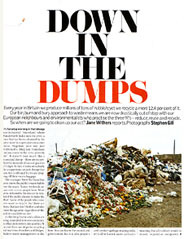 "One of the most effective natural ways of diverting food waste from landfill"
Observer Magazine featured an article on a 'rubbish revolution' that holds the key to a sustainable future. In their compost section, written by Lucy Siegle, the Living Soil system was assessed as the best for recycling food waste, especially for people living within urban and suburban environments. describes how EM can help tackle the world's problems. Ode magazine discusses the uses of EM in enhancing food production, health and the environment. Featuring sections on EM for water purification, natural forestry management, shrimp and fish farming, and in deodorising landfill sites across south east asia. The mixture used to make Bokashi, which turns food waste into super-soil, is sometimes known as 'EM' - 'efficient microbes' or 'effective microorganisms'. 'Probiotics', refers to a mixed microbial culture of selected species of beneficial (healthy, safe) microorganisms which will break down organic waste in a safe and beneficial way! 10 Reasons to Compost Probiotically with Bokashi and Kitchen Composting! "What is Probiotic Composting and EM"